We gave these away for my daughter's 10th birthday party at a bakery. Fit perfectly with the theme and everyone loved them. 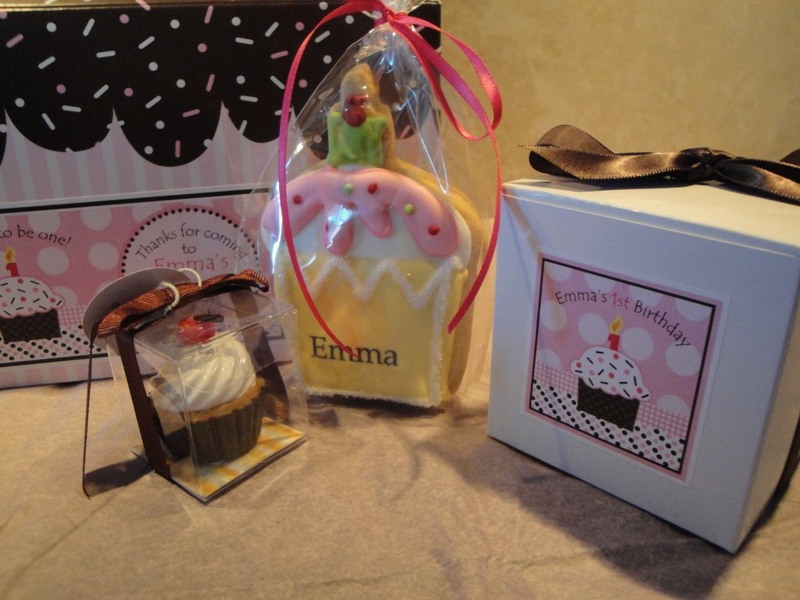 These unique gourmet cupcake mixes made great favors for my niece's 'Little Cupcake'themed 1st birthday party. The accompanying recipe is easy to follow. The cupcakes are truly delicious! The cupcake mix is such a great idea for a wedding shower. The bride I threw the party for loves cupcakes, so it was a personalized gift. I bought the labels from this website and put them on the boxes and then tied the heart shaped whisk to the top of each one. The whole thing was really sweet. A word of warning...when I got the cupcake mix, I was a little afraid. It was small bags of mix and then boxes that you have to fold yourself. But they looked supercute in the boxes with the labels and just tie a ribbon around them. Plus I made the cupcakes and they were delicious. I recommend the white boxes, they looked pretty with the lavender label I bought. I received my products with plenty of time to assemble them. 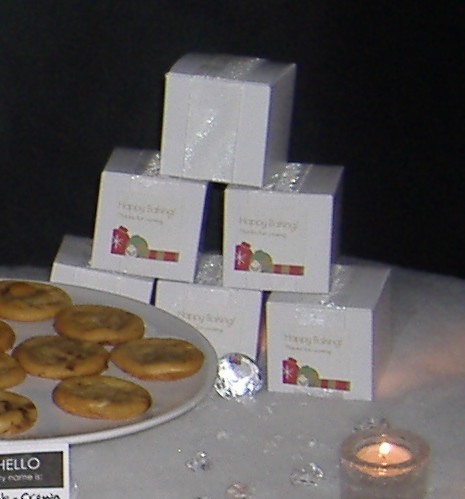 I used them for favors for my Christmas Party which featured a dessert bar. I didn't realize that the champagne-flavored cupcakes need the champagne added, so I can't wait to see how they turn out! I used this as a party favor for a bridal shower. They were very easy to assemble and I bought different colored ribbons to tie around the boxes so the tables at the shower would look colorful. The only problem I had was that you need to be careful handling the cake mix packages themselves because I did have one open up. They were a big hit with the guests as well. I thought these turned out so cute! I saved a few pennies by making my own labels and they looked great! I'm glad I ordered a few extra because a couple boxes got a bit damaged in the moving process, but I was still very happy with the final product! My sister loved them at her bridal shower! Shower Guests Just Loved These! This shower favor is wonderful. Baking is my daughter's hobby, so her shower was a cupcake theme. I purchased the tiny whip to attach with ribbon and our guests just loved them. Shipment arrived when promised, they were easy to assemble. This was a wonderful favor that our guests will use! Everyone commented on how adorable they were. Wanted something different for shower gifts for my daughter's shower. The champagne mixes were perfect! My daughter loves cupcakes so these fit right in. Used the white boxes and added a ribbon in her wedding color and a designer label. Loved it - great shower gift! Organized a baby shower - tried to think of a new gift since the group all had the standards.. Planned this cupcake theme as also brought mini ones for dessert - huge hit! Great packaging and a fun new surprise! [...] Everyone loved the mix. Many thanks! These made great favors for my sister's bridal shower. We used the labels and mini-heart wisks, as suggested, tied on with bows. All together it was a little pricey, or I'd give them a perfect score. But, everyone thought they were absolutely adorable and my sister was very pleased, so it was worth it! My sister loves cupcakes and so this was the perfect favor gift for her bachelorette party. I also bought the heart-shaped measuring spoons and tied them with ribbon to the cupcake mix box. The personalized stickers were a great touch and I'm so glad I got them. [...] The final look with the box, personalized sticker, ribbon, and heart-shaped spoons was adorable and everyone loved them! My daughter-in-law, Kathryn, loves cupcakes. I made this part of her bridal shower favors, with your labels that read "Kitty Kat's Krazy Kupcakes." She was thrilled, her friends were delighted. Sweet Things Come in Small Packages! I purchased these for party favors for a brunch-themed birthday party. The guests were pleased to receive a box as they departed. I ordered personal labels for them and tied them with a ribbon. They were really cute! I've since made two batches of twelve and was happy to discover they taste great too! My friends called to say they were so happy to have something in the pantry to whip up for drop-in guests and last minute sweets! Great job again Beau-Coup! I haven't seen these anywhere else...totally unique idea. i personalized with a label saying the "perfect mix" for my sister's bridal shower....it was a huge hit! This is a really cute idea for bridal showers or baby showers..anything for someone who likes to cook. The box was a little plain, but I spiced it up with a label and a heart whisk...very cute! Q:what are the ingredients? Is this mix vegan? A:The basic ingredients in the mixes are flour, sugar, baking soda, salt, vanilla and in the chocolate mix there is cocoa. Q:How many cakes can be made from this mix? The attached recipe　said that It'll be six regular sizes and 12 minis. A:The mix will make 6 regular cupcakes. Q:What comes with the cupcake mixes? 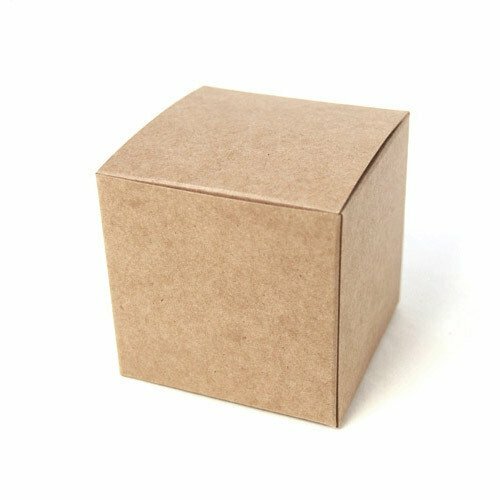 Is the box and labels included? 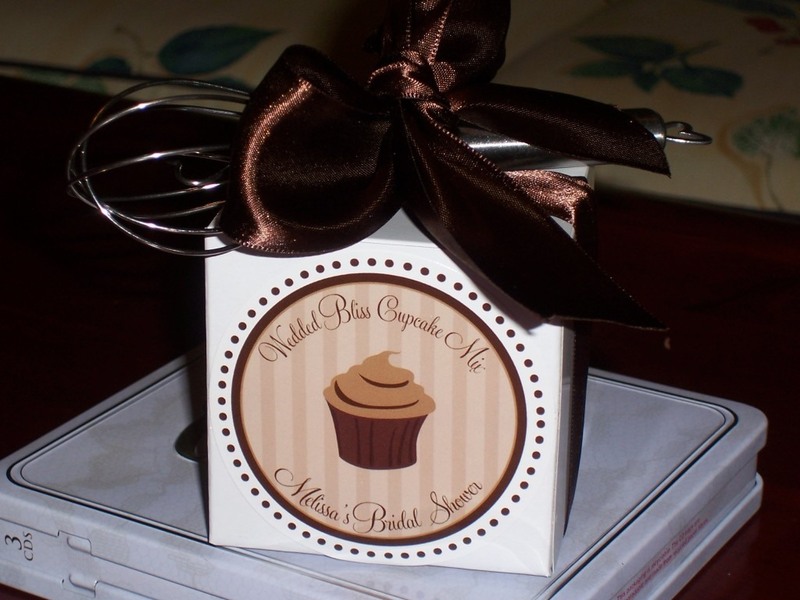 A:The cupcake baking mix comes with the baking mix and your choice of a white gloss or natural-colored box. The ribbon, labels and whisk are sold separately on our site. Q:Do you get labels for the favors? A:Labels do not come with the mixes, but we like the 2" square labels with these. You can view them by typing 1268 into the search bar. Q:Upon purchasing the cupcake mix, how long will it keep until it's expired? A:If they are stored properly they should be good for up to 12 months. Yields 1 dozen cupcakes. Labels, whisk, and measuring spoons sold separately. Afternoon sunlight pours through the kitchen window, birds sing their sweet melody from afar and the smell of fresh-baked cupcakes wafts through the house—could it be that such simple perfection came in a box? Absolutely. This gourmet cupcake baking mix is exclusive to Beau-coup—and just for you. 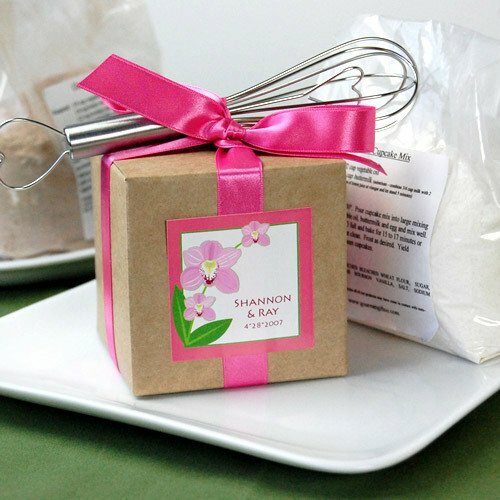 Bake a batch and serve at a cooking-themed shower or give as a unique bridal shower favor. Choose from three delicious flavors: chocolate, vanilla and champagne. Each mix is made from the finest ingredients available and comes complete with recipe and cooking instructions–combine with fresh ingredients from your kitchen, bake, and savor the sweet taste of heaven! Yields 6 cupcakes (or a dozen minis!) 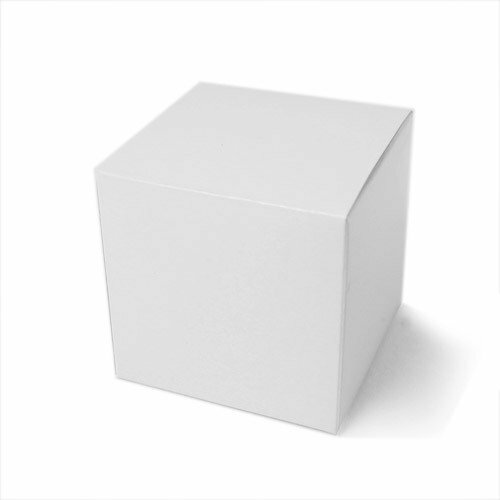 and comes with your choice of a white gloss or natural-colored box. Each box measures 3" x 3" x 3". Note cupcake mix for champagne is vanilla flavor with instructions to add champagne. Minor assembly required, boxes ship flat to prevent damage during transit. Personalize with our 2" square designer labels exclusively designed for Beau-coup or personalized wedding labels to make this gift extra special. Tie double faced satin ribbon around each box and top with a sweet set of heart-shaped measuring spoons or a mini heart whisk to complete each perfect party package. All sold separately.